Victoria is a cobby "cute as a button" black & white girl who lives with Mary, Tom & "Emma" (Ch Bondir's d'Or Aime de Tous). We co-own Victoria with Mary & we have the great fun and pleasure of having Victoria come & stay with us from time to time. She gets along wonderfully with all of our "gang" including her sisters Liesl & Rosalie and her mother "Gigi". 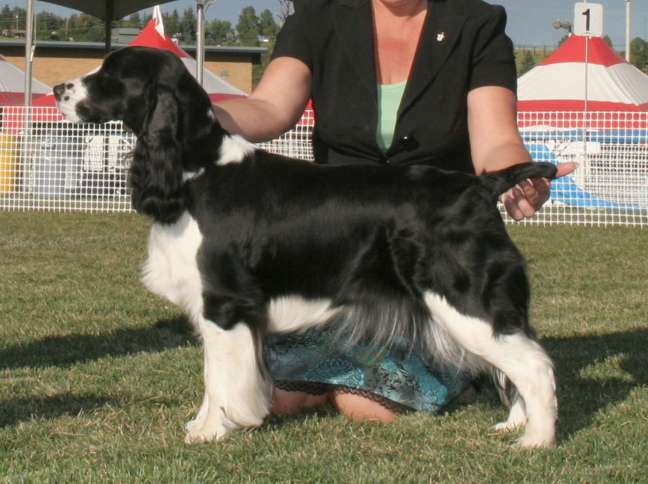 Victoria finished her Canadian Championship at the Alberta Kennel Club Shows August 2008.
she was handled to her final points by Lori-Ann Fischer -- two 3 point wins -- including a Best of Winners at the Westwinds Sporting Dog Specialty under Judge Guy Spagnola, Australia; & to finish a 3 point win under Judge Paula Hartinger. Victoria is having fun learning agility with her co-owner Mary. We are looking forward to trialing her at a later date. 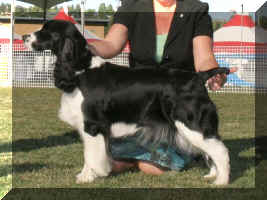 Victoria was bred to "Louis" Ch Rendition Autumfire Armstrong. Louis is a beautiful black & white boy born July 9th, 1999 with OFA Good Hips, OFA Normal Elbows, CERF 2009. Puppies whelped September 30, 2009 -- 4 puppies: 1 Black & White Female; 2 Black & White Males; 1 Liver & White Male. You can find out more about the puppies on the 2009 Litter Page.